You may ask, “Why should I do that?” With proper watering, raking and dragging techniques, you can certainly have an acceptable infield surface. 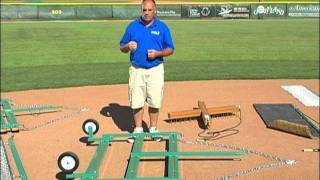 Working with a nail drag is about taking your infield dirt to a higher level. Essentially, that is what I intend these blog posts to be about – taking your field and facility to a higher level. Before we get into the details of the nail drag and what it can do for you, the questions of time and field expectations come into play. 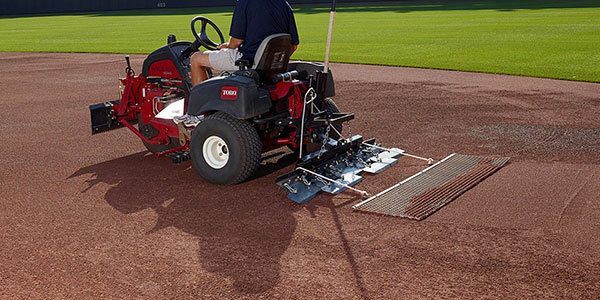 At the professional level, the game day nail drag process can be very involved and take at least two hours, including finish screen dragging and midday watering. Time management is always very important to our success as baseball groundskeepers. In my case, game day nail dragging happens with spurts of activity, followed by breaks to answer emails or look at weather forecasts. Often on days where we have a 7pm start, I will walk the nail drag across the infield skin for the first pass of the morning starting at 9:30am. I may not be done with my mid-day watering until after 12:30pm. That does not mean I have spent three straight hours on the process. I have other items to manage within that time. One potential scenario for you at your facility is to start nail dragging and get the first pass in, then get away from it and work on the mound or mow some turfgrass. Following that, you can come back to the infield skin and finish from there. Keep in mind that the weather is a big part of the day for your infield skin. A sunny day with low dew points means you can nail drag earlier and faster than a cloudy and humid day. If rain is on the way, that may be a day to skip the nail dragging and just roll to firm up your skin areas, so you are ready to handle some precipitation. The question is why nail drag? What are the reasons for nail dragging and when should you consider doing it. In my opinion there are three times for nail dragging: renovation work, game day field prep, and after a rain event. In a renovation situation, you are looking at aggressively spiking your infield skin, perhaps to a depth approaching one inch, so you can either prep the skin for re-grading or are working some calcined clay deeper into the profile. This process can occur in the fall, or maybe prior to the season, or perhaps in-season when you have at least a few days prior to play to firm up the surface after you scarify it. Game day nail dragging is the most precise of the three and I will focus on that shortly. Following a rain event, getting a nail drag onto your infield skin can be quite beneficial. Remember that regardless of the exact ratio of sand, silt and clay in your infield mix, heavy rain will cause most of the finer sized particles to sink and the coarser sand to rise to the top. 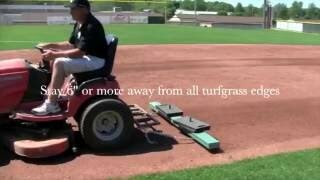 This does not leave your field unplayable, but it does diminish the quality of the surface. When the coarser sand particles dominate the upper profile of the infield skin, it tends to play a bit soft and cleats will move more loose material around. So after a rain event, as soon as you can get out there, nail drag…slowly…and the better off you will be going forward. To execute a really good nail drag on a game day, the moisture content of the skin needs to be just right. This means, depending on the time of year and your schedule, a heavy soaking of the infield skin late afternoon prior to game day or the night before is necessary. It takes some time to learn your field, sun patterns and how it takes water. In a future blog post I will discuss infield skin watering a bit. For our purposes here, consider that the post-game watering should be heavy if dry weather is in the forecast. A big part of your job as a groundskeeper is having constant awareness of the weather expected over the next 12 to 24 hours. Also, understand that you will need to go lighter on water where runners the lead off at 1st and 2nd base. Your goal with watering is to always have moisture all the way down through the infield skin profile. This is achieved by heavy soakings after practice or games. From there, you can manage the moisture in the top half inch of dirt effectively, knowing that your skin is moist down below. Why is this important? The pace and bounce of the baseball correlates to the moisture content of the entire infield skin soil profile. Lightly watering infield dirt for dust control, or appearance, will NOT lead to a high end surface that produces quality ground balls and hops for your infielders. You may not want to walk the nail drag around first thing in the morning. I like to walk it because it is good exercise and I can really get a feel for the condition of the dirt that way. If you start the day pulling the nail drag with your infield tractor, go very slow to start, and drive at a consistent speed. The dirt should be moist so that nail dragging will get all the cleat marks scarified about a quarter inch deep. If you go too fast, the dirt will start to ball up on the nails and you will have to keep cleaning the drag off. Regardless of the type of utility vehicle or trap rake you use to nail drag, remember to go slowly at first. As with all dragging of the infield, driving at a consistent speed is very important. The result of the surface will always be smoother if you drive at a constant pace. As the nail dragging process continues in the morning, you can begin to increase your speed as you go over the skin in different directions. The two reasons for nail dragging on a game day are to get all the cleat and traffic marks cleaned up from the previous day and to set up the infield surface for the game. The term ‘set up’ refers to the tractor and the nail drag firming up the skin as you work on it. 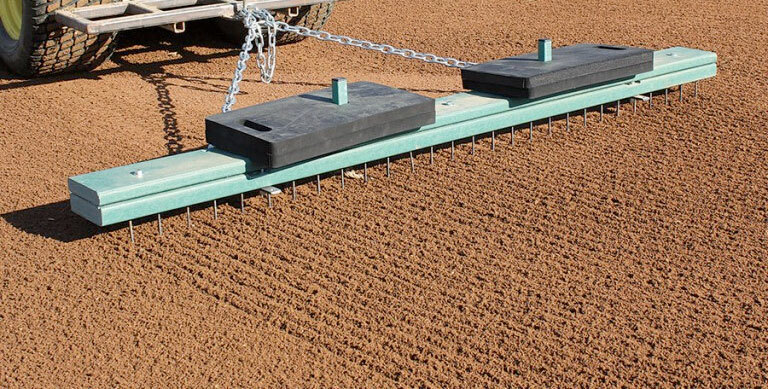 For this reason, I prefer treaded tires rather than knobby tires on the trap rake (picture below). The tires will help to firm up the surface, as will the repetition of the nail drag going over the dirt. In high traffic areas where infielders play and the lead off area around 2nd base, I will continue to drive the nail drag over those spots in tight figure-eight patterns to help firm up the dirt. The entire infield surface should be nail dragged in two or three directions, and small areas that need attention can get extra passes. Once you have worked everything to your satisfaction, you can screen drag to finish the surface prior to your mid-day watering. I advise using a stiff direction drag, the 6’ x 18” model is ideal, as long as it covers the wheel width of your tractor. The watering after this process depends on the time of your game that day or evening, and many weather concerns as well. Consider the sky cover, wind, dew points, and any rain in the forecast, then adjust your plans accordingly. Enjoy your dirt!